I recently modified my sprinkler valve and i can only get to 60 psi because all of my blow guns leak in the same area. I have a ch one and that one leaked, so i thought it was broken, so then i went to go buy a husky one and that one leaks in the same area to. Is this a common problem and what can i do to fix this? Did you use Teflon tape? That's important. Also, make sure you thread the 1/4" npt end into the sprinkler valve. To clarify, the input goes to the sprinkler valve. 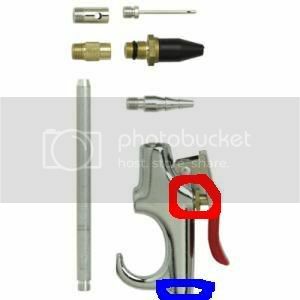 If you connect it the other way, air will push the valve open and it will leak. do you the blow gun on backwards? switch it and it will be fine. i realy like this leaking because i have a small little plinker and i use a blowgun as a main vavle and i have very tight ammo that seals. when i breach load the ammo the excess air leakes out through that hole making loading a TON easier. BTW did you mod the blow gun? if not i would suggest it because it will have MUCH greater flow and will acuate the sprinkler valve slighty better.